Oriental rug is so much more than a decorative peice, that can be described in one sentence. There are many stories about magic carpets, legendary flying carpets that can be used to transport people who are on it instantaneously or quickly to their destination. The certainty of the origin of the carpets would always continue to be shrouded in mystery. 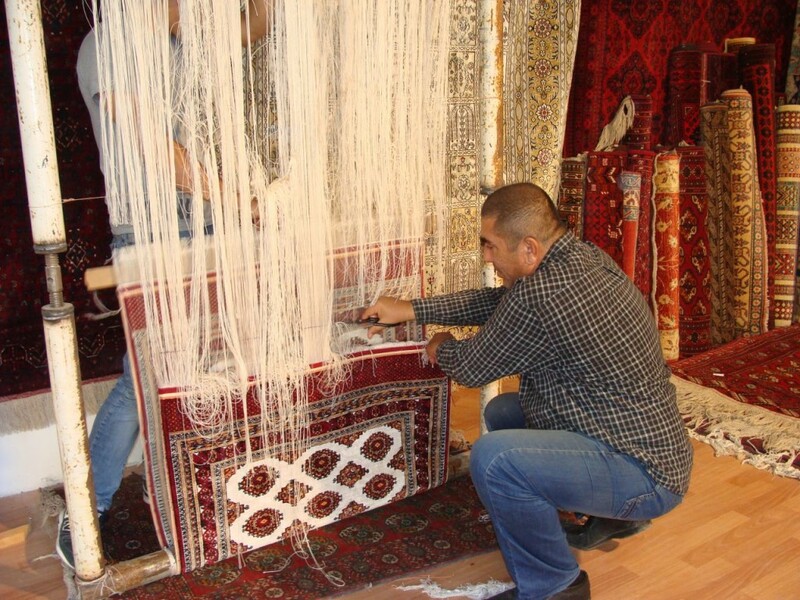 The art of making carpets was probably developed on the plains of Central Asia several thousand years ago. The nomads needed some protection from the cold winters, something more easily handled than the sheepskin coverings. At the same time they were also making decorations for their tents. Most of the antique forms of carpets and rugs that we see today reflect their rich weave and decorations of Central Asian and Persian styles. 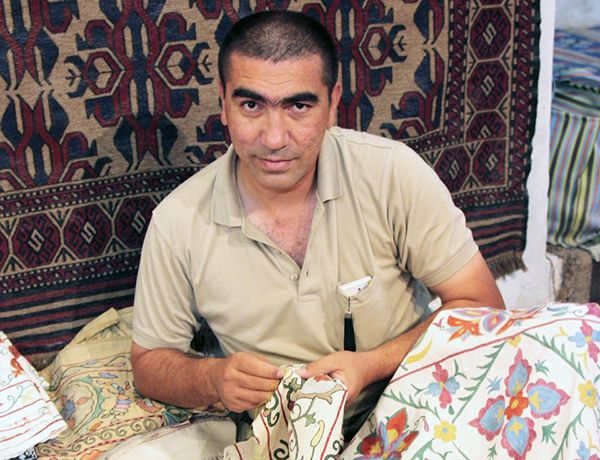 With some help from Alisher Khalikov, an experienced carpet manufacturer and exporter, native to Bukhara, Uzbekistan, we will shed light on what is going on in today’s carpet industry and discuss his latest handmade carpets, weaving techniques and colors. He participated in numerous art expositions in the US (Santa Fe, New Mexico), Kazakhstan and Uzbekistan. G.A. : Alisher, how did you become interested in this field? A.K. 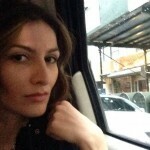 : There would be no house in Uzbekistan without carpets. By tradition that developed in antiquity, carpets have always been an important part of dwelling decoration, often replacing furniture. Being invariable in its basic trends, carpet weaving in Uzbekistan preserves its local originality and regional distinctions in styles. Thus, diversity of colors and patterns, big sizes and long pile distinguish the Bukhara carpets. It was back in the 90s when, as an accomplished carpet weaver, I realized that the ancient Bukhara carpet weaving methods were almost completely lost due to Soviet era industrialization and state-ownership. The manufacture of one carpet could take from 6 to 12 months as the density of weaving is very high: in a pattern of each product it is necessary to fasten many hundred thousand, and sometimes more than a million, knots per square meter. Unfortunately the production of expensive and labor-consuming silk carpets fell into decay. We take great pride in the art of carpet weaving; a craft deeply rooted in the city’s history. These kinds of carpets are part of our culture. If you enter the home of an Uzbek family you will see these carpets on the walls. We also have them on the floor. I couldn’t just let this tradition slowly disappear! I had to travel all the way to Afghani villages to find those very few remaining carpet weavers who still possessed the knowledge of ancient weaving methods. G.A. : Impressive! You actually managed to revive the long lost technique and bring it back to your native Uzbekistan? A.K. : Indeed. 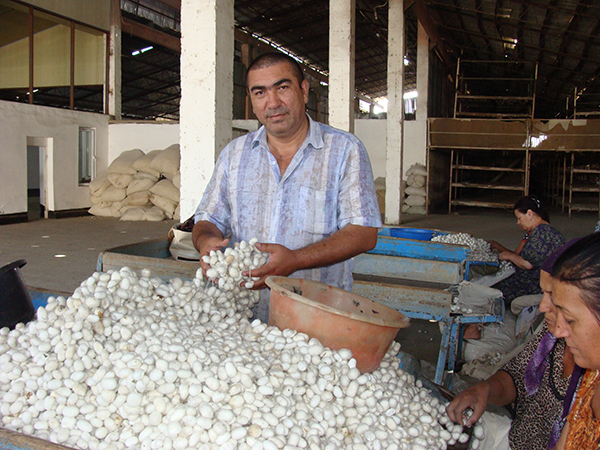 Currently, I own a carpet-manufacturing workshop where I employ 200 people under fair trade conditions. I am very proud of this accomplishment- the ancient craft has been revived. I regularly participate in trade shows and art expositions around the world. Our next stop is Cha Mega Show that will take place in Anaheim, California in January 2017. G.A. : The precious masterpieces that you create are produced from silk, what about the dye? Do you use natural dyes as well? A.K. : Our carpets are 100% silk and we have a unique method of weaving and a design that makes our carpets different. What makes it different is that our carpets are double-sided and reversible. We use a lot of motives of animals, tribal patterns and flowers. As far as our dyes we only use natural components. For example, the famous indigo dye known for its distinctive blue color is an organic compound. It’s extracted from plants, which are native to the tropics. Indigo was used in India, which was also the earliest major center for its production and processing. It’s among the oldest dyes to be used for textile dyeing and printing and because of its high value as a trading commodity, indigo was often referred to as blue gold. Regardless of the fact that Uzbekistan is located in the subtropics I invented a unique technique of growing indigo plants in our region. It makes it so much easier and cheaper to produce natural dyed rugs in my hometown. What’s great about it is that this know-how can be applied in the Unites States as well. G.A. : Do you apply the ancient weaving techniques in your workshop to create exclusive Bukhara patterns? A.K. 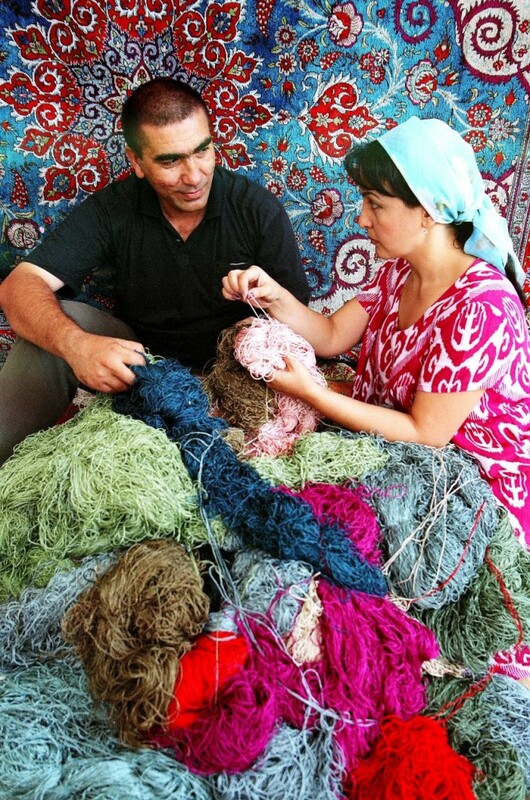 : Carpet weaving is labor-intensive and painstaking. It requires perseverance, diligence, attention and, at the same time, accuracy and swiftness in movement of hands. The high speed with which a skilled carpet-maker ties the threads on the warp stretched on the loom, and with a metal hook fastens the knot stuffing it tightly, makes it difficult to follow the swift movements of expert hands. Diversity of colors and patterns, big sizes and long pile distinguish the Bukhara carpets. However, our selection goes beyond traditional Uzbek patterns – we also produce Persian style ornaments that are notorious for their complex patterns and vivid colors. I pay special attention to color patterns for my carpets sometimes combining two colors in one stich creating a unique palette. If you look at a silk carpet from a different angle it is possible to see how the background color changes its tints. That greatly enriches the color spectrum of the whole carpet. G.A. : I am truly impressed by this- if I get a chance to visit Bukhara I can see your creations in person! A.K. : There is no need! If you would like to acquire a genuine 100% silk natural rug you can order in from my online store at www.bukhara-carpet.com and it will be delivered right to your door. In Uzbekistan it is possible to buy carpets at almost every market, but now it’s possible to have them delivered right to your door. I would like to think that it brings me closer to the legendary magic carpet from the Arabian Nights.